In 1921, four men ventured into the Arctic for a top-secret expedition: an attempt to claim uninhabited Wrangel Island in northern Siberia for Great Britain. With the men was a young Inuit woman named Ada Blackjack, who had signed on as cook and seamstress to earn money to care for her sick son. Conditions soon turned dire for the team when they were unable to kill enough game to survive. Three of the men tried to cross the frozen Chukchi Sea for help but were never seen again, leaving Ada with one remaining team member who soon died of scurvy. Determined to be reunited with her son, Ada learned to survive alone in the icy world by trapping foxes, catching seals, and avoiding polar bears. 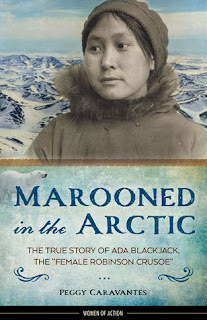 After she was finally rescued in August 1923, after two years total on the island, Ada became a celebrity, with newspapers calling her a real “female Robinson Crusoe.” The first young adult book about Blackjack’s remarkable story, Marooned in the Arctic includes sidebars on relevant topics of interest to teens, including the use cats on ships, the phenomenon known as Arctic hysteria, and aspects of Inuit culture and beliefs. With excerpts from diaries, letters, and telegrams; historic photos; a map; source notes; and a bibliography, this is an indispensable resource for any young adventure lover, classroom, or library. I don't read a lot of nonfiction but this one caught my eye. Coming in with just over 200 pages it was a relatively quick read, there were actual pictures which did add to the narrative. This is targeted to a younger audience which the writing reflected nicely. 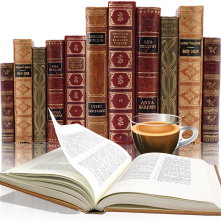 The author set up the story with bio's of each of the 4 men that accompanied Ada on the journey as well as her story. An interesting read showing the harsh events of those 2 years for Ada. It wasn't an in-depth look but considering the audience I think it was enough. Local customs.traditions were defined to explain them to the reader. This was an educational read about a woman that history seems to have forgotten. I think middle grade ages would also enjoy this one, it gave enough details without going into graphic detail. Marooned is a fine example of a young mother who did not give up, but was determined to provide and survive for her young son. This one sounds really interesting...especially after just finishing The Quality of Silence, a modern-day novel of survival in the Arctic. I'm going to look of this one.